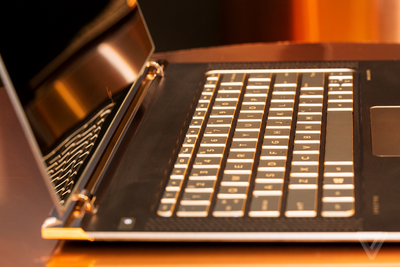 This laptop from HP is only 10.4 mm thick. When it comes to laptop computers, there’s a clear and obvious winner—Apple. MacBooks (whether Pro or Air) are sleek, powerful, and intuitive. Competing brands have yet to create a computer that could rival the specs, efficiency, and aesthetics that Apple’s machines are known for—until today. HP just introduced the Spectre 13, which they boldly claim to be world’s thinnest laptop. At just 10.4 mm, it’s significantly sleeker than Apple’s MacBook Air (which is 13.2 mm) and Dell’s XPS (15.2 mm). But are these few millimeters enough to make a major difference when it comes to gadget-loving consumers? Yes—particularly when size is combined with a beautifully designed chassis to house impressive hardware and a pretty good 9.5 hours of battery life. The 13.3 inch laptop has a 1080p display, 8 GB of RAM, and 256 GB of storage. It runs on a Core i5 or Core i7 processor—which are comparable to the ones used by the MacBook Air. Laptops this thin will usually use a Core M, which means you’re basically trading speed and computing power for a lighter and smaller machine. “But our customers want Core i, and I’m here to tell you today we pulled it off,” explains Mike Nash, HP’s vice president for consumer PCs. With this new claim to fame, the next question is, how long can HP keep the title?